Your easy budget and financial planning spreadsheet for busy families just like yours! Are you ready to take control of your family finances in as little as 30 minutes a month? Can you predict your cash flow 6, 12, or even 18 months into the future? Do you spend less than 30 minutes a month paying your bills and working on your budget? Do you know where you stand financially when an unexpected expense happens? If you answered NO to any of these questions, the Easy Family Budget Spreadsheet can help you! 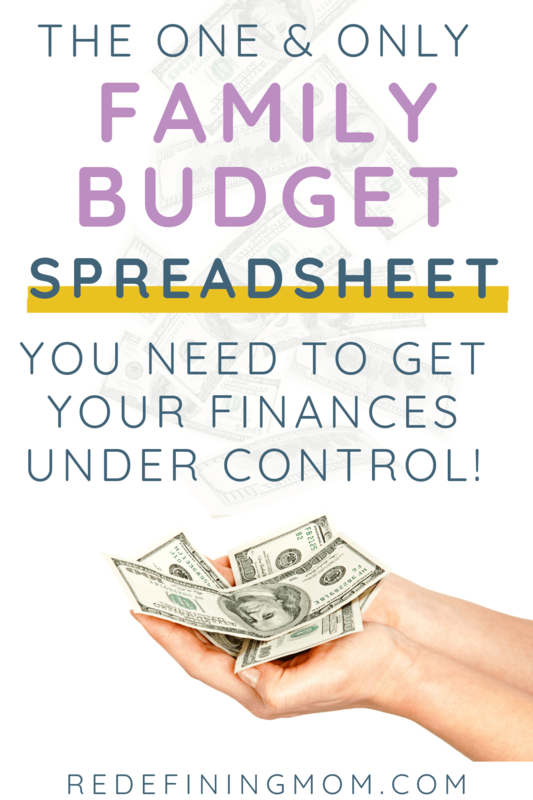 THE FAMILY BUDGET SPREADSHEET WORKS WITH GOOGLE SHEETS AND MICROSOFT EXCEL! This system will allow you to cut back on the amount of time you are working in your finances so that you can put your finances to work for you! The Easy Family Budget Spreadsheet will help you allocate your tax refund where it matters most in your budget! THIS IS THE FAMILY BUDGET WORKSHEET YOU'VE BEEN WAITING FOR! GET INSTANT ACCESS TO YOUR EASY FAMILY BUDGET SPREADSHEET NOW! Not sure yet? At least don't leave empty handed! Try out my FREE Budget Planner printables! Yes, I need a budget planner! I'M READY TO GET MY FAMILY BUDGET UNDER CONTROL, SIGN ME UP! Disclaimer: Redefining Mom LLC provides this template for sale for informational purposes only, it is not meant to replace financial advice from a qualified professional who is familiar with your specific situation. Easy Budget and Financial Planning for Busy Families should not be relied upon as professional financial advice. If you need professional advice, please seek paid help from a professional advisor such as a CPA in your local area.